TO VEST OR NOT TO VEST, that is the question? We have had the warmest September since records began, it has been really HOT this week. Today is the 1st day of October and the WEATHER has turned! It is cloudy and definitely cooler, for the first time this SUMMER I have dressed in LINEN trousers with a 3/4 length sleeve BLOUSE and CARDIGAN. It is now mid-day and has warmed up, so it looks like October may be warm, hooray! It may be sometime till I get my VEST out. My dear ladies and occasional gentleman, My dear friend Veronica and I stepped into the RETAIL world when we booked a table at the hall next to SAINSBURYS for a TABLE-TOP SALE. Ron the organiser, explained over the phone that we were to put our sale items in a SAINSBURYS trolley and make our way to the rear entrance. Veronica asked if we could just carry our goods in. Decidedly not. According to Ron The only way is to transport the goods in a SUPERMARKET trolley. We duly parked and collected a trolley each, loaded up and made our way to the rear. Where we joined a collection of trolleys and a DISTRAUGHT Ron. Apparently the over 80’s GAY GORDONS CLUB had overrun, there were vague mutterings and accusations of the EARL-GRAY being SPIKED. But the upshot was poor Ron had no tables ready. We joined the throng, there was a bit of POSTURING and PUSHING as people tried to maintain their position and some distinctly unfriendly glares. Which I turned away from and found myself face to face with a very pleasant lady and we chatted while we waited. We had nearly unpacked every thing, when a young lady accosted us and said “this is my table”. It’s a very competitive business, the table-top sale! Ron bless him soon sorted things out and we were able to stay where we were. I was selling a rather smart LINEN skirt and discussed the joys of linen and my price with a woman, she then gave me a superior smile and said “it is too big for me” and walked off. A little lady tottered up and asked “does your knob get hot?” It took me a while to realise she was talking about a TEAPOT! “I’m not sure” I said. That’s another sale lost but it was OK because two very nice young men came along a little later and bought it. I’m sure they have LADYLIKE tea parties. Veronica nudged me and directed my gaze to the older ladies across the way, “old ladies eat a lot of bananas don’t they?” I must say it wasn’t something I had noticed before, but now that she had mentioned it, yes they do. “Humph,” he said walking away, last of the big spenders! Not being sure if he meant eating the bananas but opting for the tapestry, I reassured him “Of course, lots of men knit and sew, there is equality in most things now you know, so if you want to you can”. There were many incidents but I have just realised that I have been chuntering on so I had better go. 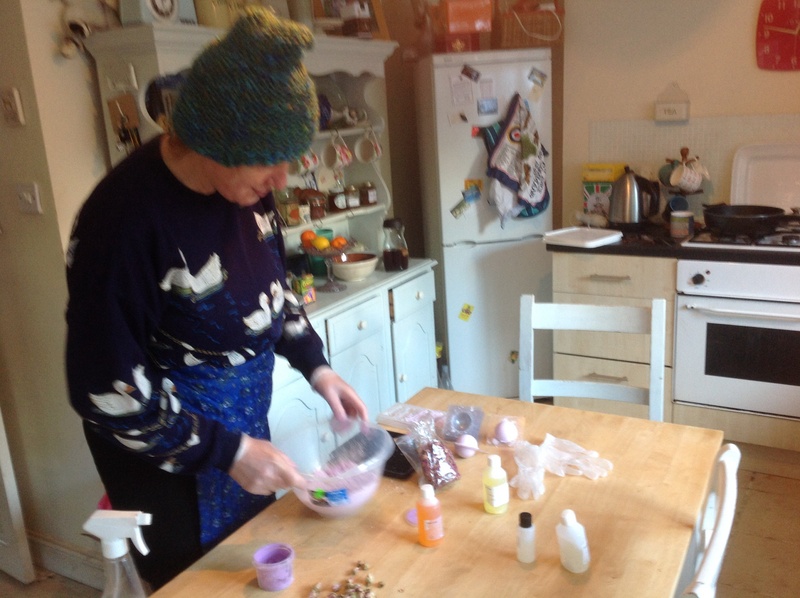 ALCHEMY, FORAGING, LINEN & SKITTLES. Good afternoon my lovely ladies and occasional gentleman. Hello to all my new readers, how flattered am I that you enjoy my little BLISS. Hello to a lovely lady, Barbara over the pond in AUSTIN, TEXAS and hello to a new occasional gentleman Eli, all the way from Australia. I cannot mention you all but I will if you feel like commenting or want a chat. This morning I visited my friend VERONICA, Oh what fun we had. 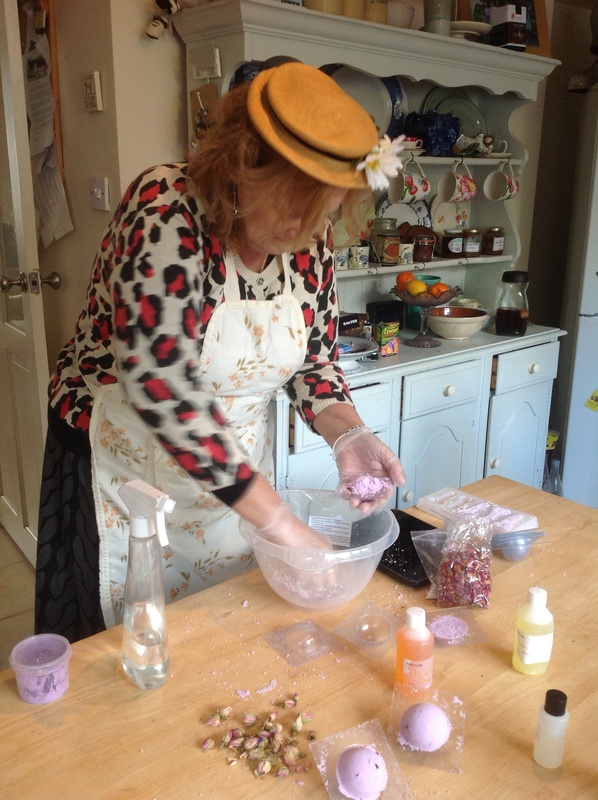 Veronica was teaching me how to make BATH-BOMBS, an unfortunate name I prefer BATH-MELTS, not so explosive. She is a clever little ALCHEMIST with her ESSENTIAL OILS and other wonderful ingredients. Afterwards we went out for a LADIES LIGHT LUNCH, how lovely. Followed by a FORAGE (Veronica has a bent for it) in the CHARITY SHOPS. It is interesting who you see skulking around the ladies section, people who would rather have you believe their garments came from JOHN LEWIS! We did meet some of our lady-friends and had a jolly chat, what fun. Veronica is an expert at WHIPPING HER CLOTHES OFF in a small space. She found a very CHIC ‘ELLA MODA linen dress for me and a LAURA ASHLEY for herself. I discovered a LOOSE LINEN top for Ronald very OUZO, he likes a bit of GREEK. I must dash, we are off out for a SKITTLES DINNER this evening, we’ve been invited because Ronald plays when the local team are a man short.